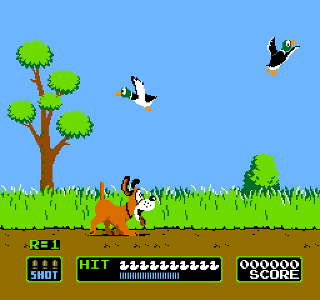 Duck Hunt was not only a launch title, but was a pack-in game if you purchased the “NES Action Set”, where the game was bundled on a single cartridge with Super Mario Bros. Although less common, the game was also released as a stand-alone retail cartridge. Duck Hunt has 3 game modes, each requiring the Zapper gun in order to play. The first two modes give the game its name. As your hunting dog jumps into the tall grass he scares out 10 ducks that fly out either one or two at a time, depending on which mode you choose. Either way, you have three shots to kill each wave. Expend your three shots with ducks still on the screen, and they fly away. After each round of 10, if you’ve killed enough of the ducks then you advance to the next round. With each subsequent round the ducks fly faster and faster, but that’s the only variability in the game, so it tends to get boring. The game should have had only one duck hunting mode that starts out with one duck, and increases to 2 and then 3, with their speed increasing after every round. The third play mode is called “Clay Shooting” and involves shooting clay pigeons, which fly out two at a time. As is the case with the first two modes, you have only three shots to clear the screen. With each passing round the clay discs fly into the distance with increasing speed, and due to their small size they are a lot harder to hit than the ducks. I found the clay shooting game to be more challenging but also more fun. It provides a better challenge but also moves along at a faster pace than the duck hunting does. Duck Hunt is good for a quick game but doesn’t have the depth to keep my attention for more than about 10 minutes. It’s a classic game that will bring back fond memories for anyone who grew up with the NES but it definitely isn’t one of the shining starts of the platform. Buy Duck Hunt on GameGavel or Amazon. Tagged Duck Hunt, launch, Light Gun, NES, Nintendo, Review, Zapper. Bookmark the permalink.